The Department of Modern Languages and Cultures begins offering courses in Portuguese this fall, adding to the department’s roster of courses in Chinese, Japanese, French, German, Italian, Russian, and Spanish. Portuguese is the principal language of Brazil and a number of African countries in addition to Portugal. Brazilian Portuguese may be heard on campus during regular sessions organized by the Center for Study Abroad, depending on interest among students in learning more about the language. The get-togethers are modeled on a set of “conversation hours” administered by the Department of Modern Languages and Cultures. The sessions are designed as relaxed settings for speakers to practice their language skills. The Eastman Philharmonia’s first European concert took place in Lisbon in 1961, the first stop of a 93-day tour of 34 cities undertaken at the invitation of the State Department. Robert Sherman ’75 made his career as a Boston attorney for 35 years, serving in private practice and, in the 1990s, as assistant attorney general of Massachusetts and chief of the state Consumer Protection Division. 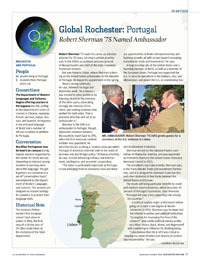 But now home is Lisbon, where Sherman is serving as the United States ambassador to the Republic of Portugal. He began his appointment in the spring. 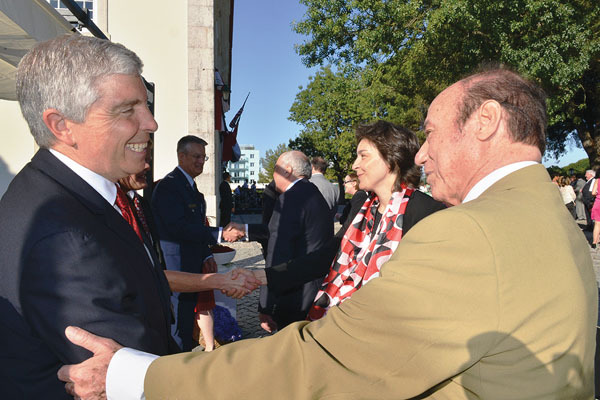 Sherman is the 25th U.S. ambassador to Portugal, though diplomatic relations between the countries reach back to 1791, when the first American resident minister was appointed. He describes his job as being a “zealous advocate within Portugal of American interests both in the realm of business and also foreign policy.” Embassy priorities, he says, include enhancing military, law enforcement, intelligence, and economic cooperation. “The latter is particularly important as Portugal is now emerging from its economic crisis and there are opportunities to foster entrepreneurship and business growth, all with an eye toward increasing transatlantic trade and investment,” he says. A long-standing ally of the United States and a founding member of NATO, as well as a member of the European Union, Portugal has supported the U.S. in security operations in the Balkans, Iraq, and Afghanistan, and joined the U.S. in condemning Russia’s involvement in Ukraine. Sherman served on the national finance committee of Obama for America, and was appointed by President Obama to the United States Holocaust Memorial Council in 2013. A political science major at Rochester before going on to earn a law degree at Boston University in 1978, Sherman says he never lost his interest in politics and political institutions “as engines for improving the lives of the citizenry” and credits political science professors Riker, Fenno, Black, Niemi, and Regenstreif with continuing to influence his thinking today.